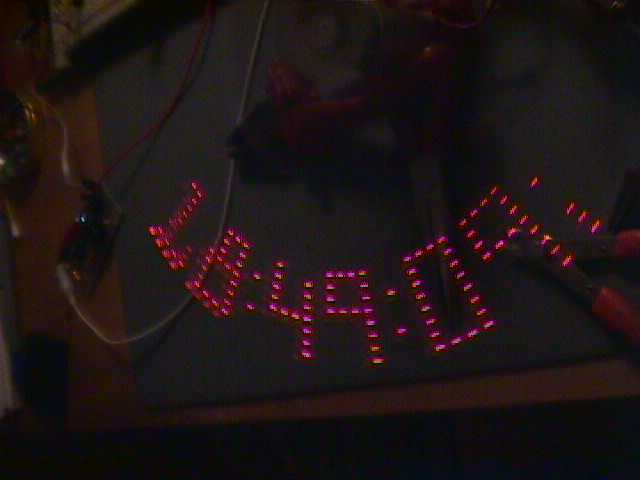 Starting with every new round the LED's display the current time or date. A DCF - receiver gets the current time, an infrared - LED emits it to the rotating electronic. Power supply for the rotating system is the motor collector. This picture shows the display in action, the dots right to the '9' looking like an 'i' - is the DCF status info. The displayed figures are transparent and seem to hover in the air, if the motor turns too fast, the apparatus reminds on a fan. The main parts are the modified Motor, the Rotation-Electronic with Display-LED's, the IR-Transmission-Electronic, the DCF-Receiver. While the Motor swivels the Rotation-Electronic this receives the data to display on the LED's and watches the beginning of any new round to make the display standing still. The IR-Transmission-Part evaluates the DCF-signal from the DCF-Receiver, and sends once a second new data to the Rotation-Part. 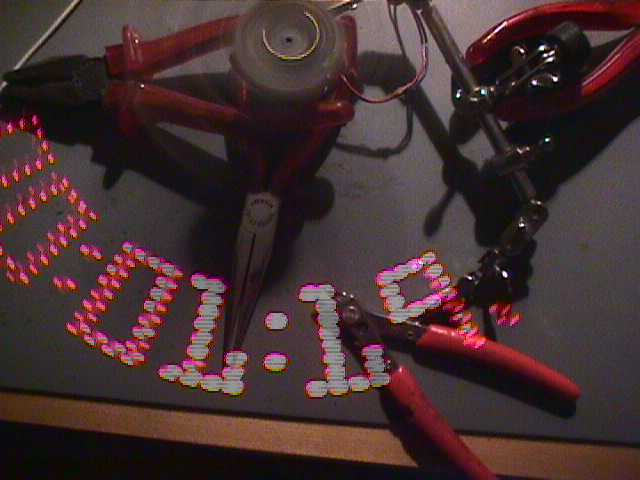 Bob Blick shows you on his site how to modify one, in this schematic 3 collectors are used. I worked with a 7-collector 5 1/4" disk-drive-motor with only 3 collectors connected, with gratifying result, ev. you have to enlarge the corresponding capacity in the power supply. Because all motors I tried turned too fast, I soldered one 4,7 - 10 Ohm resistor in every coil-part of the motor (one per collector), now they are at last calm and nicely slow. The power supply of this part comes from the motor collectors rectified by diodes separately for the LED's and the controller. From one motor collector the signal _LSYNC is derived. The controller is a Atmel AT89C2051 (8051 derived) with 128 bytes of RAM and a 2 Kbytes flash-EPROM onchip. The controller waits for falling edges of _LSYNC and then starts putting out his display-ram on the LED's, this is done with every new round of the motor axle. At second the controller has a look at the incoming data from the IR-detector, fills it's display-ram with it or (de-)synchronizes with the rotation if this command was detected among the incoming data. The SFH505A is an integrated IR-receiving-unit with high sensitivity and is quite easy to use, but not the best choice, because it is thought for VCR or TV IR-transmission-controls and so don't likes continuous working. When transmitting data, there have to be gaps in the byte stream. 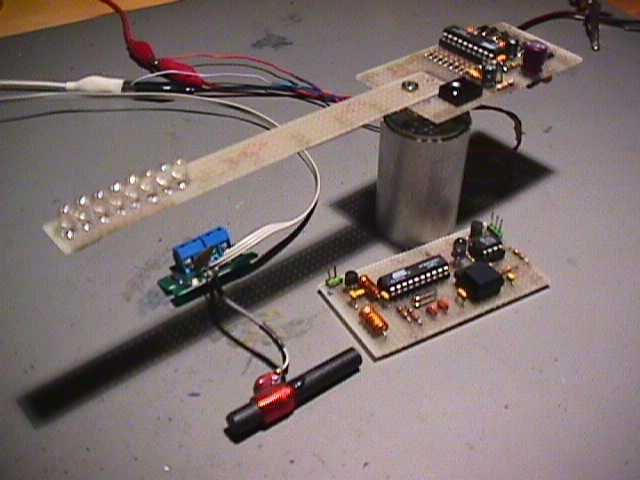 An other problem is, that the transmission works with the controllers built in serial-abilities that have well defined tight tolerances, such if the IR-LED is too close on the SFH505A the transfer won't work, change the pre resistor of the IR-LED or try indirect transmission over the ceiling or wall. Perhaps you know a better component as the SFH505A - let me know. 5.-8. LED = running up = wintertime, running down = summertime. The same 2051-controller is used in this scheme, it evaluates the signals from the DCF-part and holds the current date and time and further receiving-infos in his RAM. Once a second the controller forms this data with help of a character-matrix to a serial data stream. This is handed after invertation to the following NE555-timer that modulates it with 38 kHz; at last the IR-LED radiates this signal. S1 on the controller switches between time- and data-display. You can buy this part ready to use from Conrad-Electronic. There are pedants for DCF in various countries, but protocols and frequencies will differ. Source code download for both controllers is in AVR assembler and ready for programming in Intel-Hex format. Be careful, this device awfully strikes your fingers if getting too close, it also totters around like drunk if not balanced carefully.